Korat Cat breed information, advice about Korat cats. Korat cat breed information, advice about the Korat cat. Korats have an outgoing personality and handsome good looks. You only have to look into a Korat's beautiful green eyes to fall head-over-heels, and because those stunning peepers are constantly watching you, you'll be seeing plenty of them! 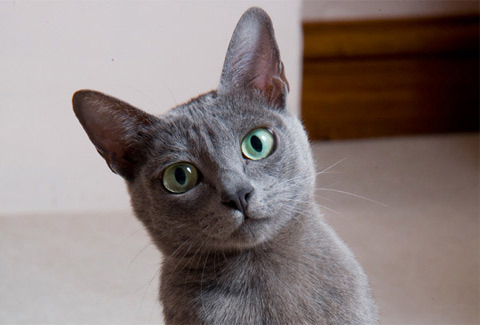 Jen Lacey, chairman of the Korat and Thai Cat Association, has been breeding these wide-eyed wonders for over 30 years. She says: "They are very loving and loyal and form a close attachment to people. They are a breed with a long history and they respond to you, sometimes more than you want! "They will follow you everywhere - even into the bathroom! They are very people-orientated and extroverted - it's this interactive quality I love." Many owners say 'You don't know what you're missing until you've been owned by a Korat' and with their natural playfulness and outgoing natures, it's not hard to see why. They like to explore and have adventures, but also love plenty of fuss from their humans. Korats are not a breed to sit quietly - as Jen says, they crave human company and like to be with you all the time, and they are active and lively. While they are not the most vocal of cats, they do like to talk to you. They enjoy plenty of interactive play, so be prepared to invest plenty of time with them. It's worth it as breeders promise that Korats will repay you with their love... and then some! Korats have the most beautiful blue (grey) coats, often referred to as being 'cloud coloured'. The fur can seem light and silvery in colour due to translucent tipping on each hair - the longer each tip is, the more silvery in appearance the coat is. And to top it off, just look at those beautiful green eyes - the Korat's eyes seem to glow in their sweet little heart-shaped faces. Their bodies are muscular, firm and semi-cobby in shape - more solid than their light, active nature suggests. The Korat breed has over 600 years of history! Thai pictures and poems describing the breed date back to the 14th century, and suggest that the breed has hardly changed at all throughout the centuries. As their name suggests, they originate from the Korat region of Thailand and they're also known as the Si-Sawat, which means 'greyish blue'. In 1959 an American ambassador was presented with a pair of Korats while on a visit to Thailand and these two were the foundation of a breeding programme in the US. Korats first arrived in Britain in 1972 and the breed was granted championship status with the Governing Council of the Cat Fancy (GCCF) in 1984. As kittens, Korats are very lively and playful. Their coat and eye colour can take up to four years to develop fully. You should expect to pay around £450 for a pet quality kitten, although this can vary with the breeder's location in the UK. And, as the breed is still quite rare, you may have to be patient and place your name on a waiting list. Korats require minimal grooming because their coats are so fine, so a quick brush once a week should suffice. You could also give them a wipe over with a chamois leather to give their beautiful coat a gleaming shine. Korats love to be groomed and enjoy the interaction. Korats were the first breed to be screened for genetic diseases. They were found to suffer from two forms of a condition called Gangliosidosis, which affects the nervous system and can cause paralysis. Breeders have worked hard to eradicate the disease from their lines using DNA testing: "We are always very careful to screen our cats and are very proud that we have eliminated it," says Jen.